Now that most of the summer tourists have departed, and the roads are a little easier to navigate, and while the weather is still warm enough for outdoor activities, you may be looking for something to do this coming weekend in the Torrevieja area. How about experiencing traditional Spanish festivities, without travelling too far? In the Campo de Guardamar, the weekend of the 15th and 16th September 2018 is your last chance to experience the Fiesta de la Virgen de Fátima. It’s a spectacular weekend, and the culmination of three weeks of celebrations honouring the ‘Virgin del Rosario de Fátima’. During each of the first three weekends in September, the Campo de Guardamar is filled with the noise of fireworks, music and merriment. The ‘Queen’ is chosen and paraded, and each Saturday and Sunday are a party days. There are sports competitions, music events, plenty of paella, and copious amounts of wine. As local fiestas go, this one is relatively new. It began in the 1950s, as a celebration for the building of the chapel dedicated to the Virgen de Fátima. Sixty or more years later, I guess you could say it is now established as one of the best festivals in the area. What is the timetable of events for the weekend? The festivities begin at 1pm on Saturday with a mascletada – launching of rockets and bangers in celebration of the Virgin of Fátima. 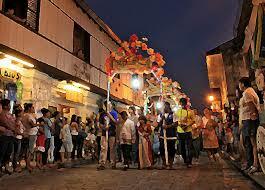 Then, at 6pm, the parade of the Festival Queens begins at the church. A fancy dress parade is at 9pm, and more fireworks signal the end of the parade. This is when the serious stuff starts! There is a wine party to get you in the mood for night shows that bring you music and dance through to the small hours. In the early morning, the Festival Queens will invite you to eat chocolate and cake. You may decide to stay over the night (book as early as possible), but you shouldn’t expect to get too much sleep. As is customary in Spain, such festivals are marked by a ‘wake-up parade’. A band tours the Campo from 6am, waking the Festival Queens and everyone else! Fortunately, Sunday is a slower and more serene day, with a balloon experience lasting one and a half hours from 9.30am. Where is the Campo de Guardamar? Guardamar is only a few minutes north of Torrevieja. The Fiesta de la Virgen de Fátima takes place in the campo, between Moncayo and El Raso on the CV895 – better known as the Lemon Grove Road. After the festivities of Saturday night, you’ll be done by around midday on Sunday. Perfect to hop in your car and take a leisurely drive to Christopher’s for Sunday Lunch. To book your table and ensure a perfect end to a perfect weekend, Call us on (+34) 600 01 28 24.